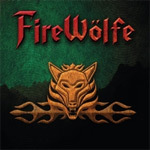 Here's the bottom line at the start: if you dig classic American melodic heavy/power metal, then you should stop reading now and buy Firewolfe's debut album. Here' the long review, if you'd like to stick around. Firewolfe is a collaborative effort of love by five dudes making music that they love and would listen to themselves. It also reflects their influences which include, to name only a few, Priest, Maiden, Savatage, and Accept. Firewolfe is powered by the twin guitar assault of Nick Layton and Paul Kleff, two masters in their own field. Aiding them at the microphone is David Fefolt (Angels of Babylon, Hawk, et al) with his clean, assertive, and pure metal vocal style. They are undergirded by the precise rhythm section of Zach Uidl (b) and Jay Schellen (d). But let's get to the music. You're met with some brisk melodic metal at the start with Air Attack as heaviness merges with some sweet melodic hooks in lyric and vocal arrangements. Ditto for Unholy, perhaps closer to melodic hard rock, maybe later Rainbow meets early Whitesnake, but edgy enough to be metal. Bless those guitar angles. However, it does get a little tiring at the end with constant repetition of the chorus. The guitar fills are the only salvation. Firewolfe turns to epic power metal with title cut. It's quite a change from the previous material. Mixing tempos, the song charges on, both telling a tale and delivering vigorous classic metal. Armed Forces returns to catchy hooks found earlier, but while melody and accessibility remain, heaviness and power are the key elements here. Firewolfe blurs the line between melodic hard rock and metal on Back From Hell. Between the clever lyrics with it's arresting chorus and the bold melody, this is seriously entertaining material, and then there's those guitar solos. Turn it up! Considering the tune and just thinking out loud, I wonder what this song would sound like stripped of the metal and put into a blues rock context. Or maybe just done 'unplugged' as an afterthought. From here to the end there's some rather interesting material, but also an awkward moment. Wicked Words once again melds metal with harder melodic rock but, expecting the drumming, this song fell flat on my ears. It sounded like a clone of a Jorn Lande tune. The instrumental Ice Wizard follows. It's more a collaborative arrangement among the players rather than merely a showcase for guitar fireworks, and that's a very good thing. Tempter is once more melodic metal with a clever arrangement and AOR sensibility, but some times a foreboding feel. This debut rounds out with M.O.D. (Metal or Die) and Feel the Thunder, two very good metal anthems. Both are marked by sophisticated arrangements allowing every musician to shine but, also, quite simply, massive amounts of riffage, melody, and fiery fret work to rock you to the bone. Finishing well is always good. The band of metal brothers that is Firewolfe get classic melodic metal right on their debut. Well-crafted arrangements and strong musicianship make Firewolfe inspired and entertaining heavy metal. Buy this album and rock on! Firewolfe debut album is inspired and entertaining American melodic heavy metal, and should definitely be on your must buy list for 2011.